Opening Day of the Major League Baseball season is the most wonderful day of the year. All 30 teams have the same record, the possibilities are endless and hope springs eternal. Most baseball fans will agree that MLB Opening Day (and possibly all of Opening Week) should be a national holiday! Basically, you shouldn’t have to work until your favorite team throws its first pitch at home. While we all wait for that to happen, here are 31 photos and stories from Opening Day 2017 at AT&T Park — where the San Francisco Giants defeated the Arizona Diamondbacks 4-1. Whenever you attend an Opening Day baseball game, be sure to arrive at the stadium at least 45 minutes early. That’s usually when the pregame ceremony begins. First, the visiting team’s players are announced (and loudly booed). Then, it’s time for the home team to introduce their lineup (to a symphony of loud cheers). 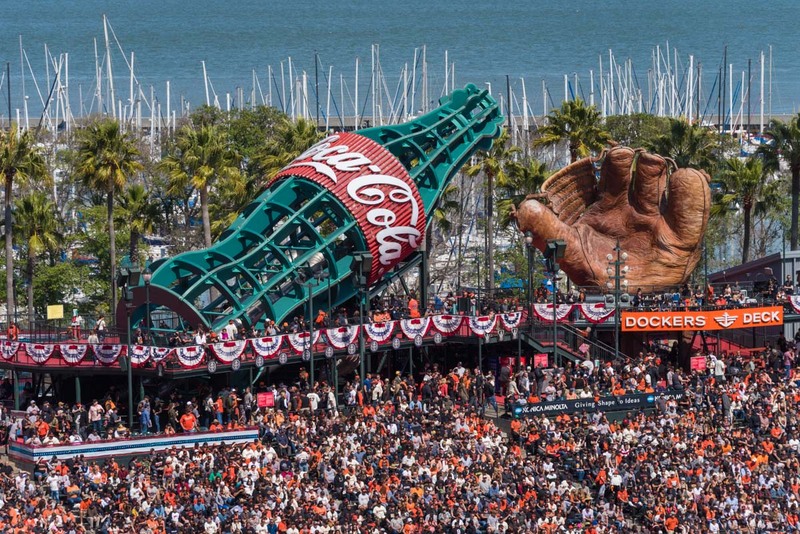 Finally, once everyone is standing on the field, it’s time for the most wonderful moment of Opening Day … when the San Francisco Giants unfurl a giant American flag in the outfield. As some celebrity sings the National Anthem (performed by the Schuyler Sisters in 2017), hundreds of lucky fans have the honor of holding the Stars and Stripes, while tens of thousands of cameras document the moment for prosperity. On April 10, 2017, the San Francisco Giants took on the Arizona Diamondbacks during an exciting Opening Day (technically Opening Week) baseball game. The Giants won the game 4-1. In addition to watching the game, I wandered around AT&T Park with my camera and snapped a ton of photographs. From the far corners of the upper decks to field level, standing room, the bleachers and beyond, I had a blast chronicling my home opener experience. Here are a few of my favorite photos from Opening Day 2017 at AT&T Park. Fans in the left field watch the SF Giants play ball! From the upper decks of AT&T Park, fans are treated to sweeping views of San Francisco, the Bay and beyond. The best place to view the city skyline is from the highest rows of the right field upper deck, and from the concourse behind the left field upper deck. For views of the Bay Bridge, you should also head to the upper deck … anywhere between home plate and right field. Meanwhile, if you want to gaze out at McCovey Cove and Oakland, head up towards the left field upper deck seats. Basically, wherever you sit, your view of San Francisco will be amazing! If you’re lucky, you’ll be able to get good seats at face value months before the baseball season begins. However, if you’re like me, you’ll find yourself scouring StubHub in the days and hours before game time. While I was ready to pay more than $100 for a ticket to the game, I wasn’t finding much online. On a whim, I decided to check the San Francisco Giants website and saw that they still had standing room tickets for $79 (plus nearly $20 in service fees). Since I was going alone, this seemed like my best bet … though I had no interest in paying those exorbitant fees. So, I did what any rational fan would do. I prepared to offer a scalper a Ben Franklin for good seats, and first went to the box office and found they still had tickets available. Best part, there was no surcharge at the stadium! Moral of the story? Always check the baseball team’s website before going to StubHub or a scalper. That, and get there early so that you can photograph the outside of AT&T Park before going in. Although there were empty seats and I was able to get a ticket 1 hour before gametime, Opening Day was supposedly sold out.